Get dirt or gravel removal in Palm Beach by calling XS Trash for all of your excavation needs. We will remove the unwanted debris from your driveway, home, or construction site in no time with a bobcat and licensed professional. Call now! Our large trucks can help with dirt or gravel removal in Palm Beach with ease! Call our team when you want a bulky item removed. We can call our licensed bobcat operators to help you get rid of whatever is currently disrupting the looks of your property. We can also handle most loads in a single journey, thanks to our trucks. Look to us for the majority of your Dirt or Gravel Removal in Palm Beach, Florida. XS Trash best evacuates useless things with our on-location Bobcat Operators. Why experience the issue of sticking around for another company when we can help you now? Look to XS Trash for quality cleanups that will fulfill without fail. We set ourselves apart through our Eco-accommodating way to deal with disposing of debris and trash. A large number of the things we gather are re-purposed or reused later. 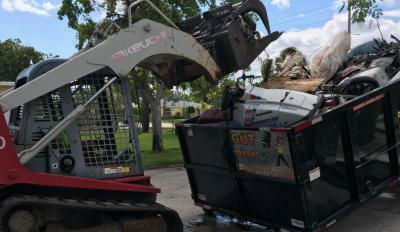 Book us for a same-day Dirt or Gravel Removal in Palm Beach and unwind knowing a nature-conscious organization like XS Trash is at work! Get a consultation now!